Mangalica ham from Spain. Air-cured jámon is a Spanish culinary icon and a true pleasure for the taste buds. This ham is made from the heritage mangalica hog, native to Hungary, which offers distinctive dark meat and abundant marbling, making it the perfect candidate for extended curing. Fourth-generation maestro jamoneros - literally 'masters of ham' - cure the mangalica ham for 3 years at high altitudes in the fresh, clean air of the Rasillo de Cameros Mountains. Best enjoyed when sliced paper thin, and served with wine, cheese, nuts and fruits. Please be sure to read our tips before serving. There are carving techniques that you need to know before you start. Watch our video to see the correct carving technique. This cured ham needs to be handled properly for the best experience. Be sure to trim the thick layer of yellow fat off before carving, but only in the area you are going to carve. This is a natural build-up that occurs in the long curing process as a barrier to the air, but it is bitter tasting, and not suitable for eating. The layer is protective, so keep the slabs you trim off to place back on top of the carved area when you store it. Use a long, flexible knife for slicing. Cured ham is best served at room temperature. A bone-in ham will continue to cure, even after you carve it. Store it in a cool, dry place, loosely covered with a cloth and allow it to breathe. 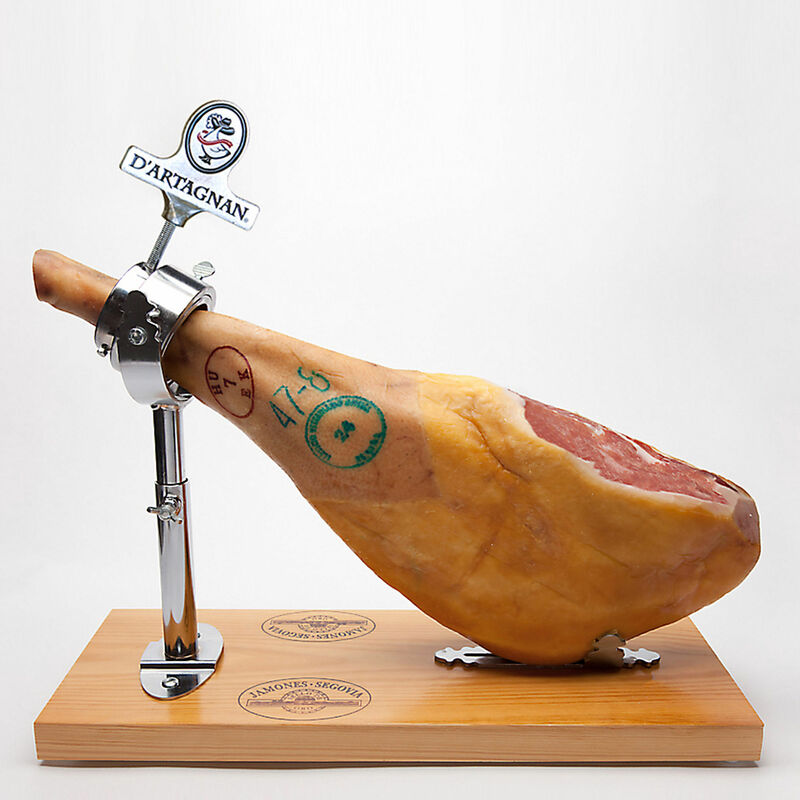 In Spain cured ham is often left in the stand on a sideboard (covered with a cloth), so people can just slice off a piece or two for a snack as they pass by. This daily attention seems ideal for a cured ham. If you will not be slicing it for a few days, it is best to store in the refrigerator and bring up to room temperature before slicing. If the surface looks dry, put olive oil on a cloth and place over the dry area. Our Spanish hams are made by fourth-generation maestro jamoneros - literally "masters of ham" - who marry the best of tradition with the latest in technology. They use rare-breed pork from Black Iberian and Mangalica hogs, which are raised humanely in pastures and oak groves. The hams are cured at high altitudes in the fresh, clean air of the Rasillo de Cameros Mountains in Spain, using nothing but salt and time.